The title of this post is a bit laughable, isn’t it? I mean, really, it’s almost an oxymoron. Keeping secrets on social media? What’s the point? The very existence of social media is dependent upon sharing-not secret-keeping. But the two are intersecting more and more. Which is why I am writing a short series of posts about the topic. Beginning today with a post about “anonymous” apps. Back in February, fellow employment lawyers, Adam S. Forman and Dan Schwartz, and I were interviewed for an article in Law360, titled, “What Employers Need to Know About the New Social Media.” In that article, I discussed what I think is the wave of the future in social media for employers-apps focused on secrecy. For example, one app, Secret, allows users to share anonymous messages with anyon3e in their contacts who also uses the app. Employers in the tech industry, where these apps are particularly popular, are struggling with how to deal with (and, preferably, prevent), the loss of confidential company information. For example, an employee hears through the grapevine that the Vice-President of R & D has taken a job with a competing firm. Employee posts that hot tidbit on Secret, where all of his work colleagues (who also have the app, of course), will see it. 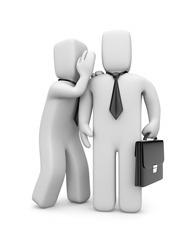 The firm can be seriously disadvantaged by uncontrolled leaks of information. And, when the app is designed specifically for that very purpose, it is hard to address with any meaningful result. As a side note, educators are struggling with a related problem. Students bullying other students via these anonymous apps is a serious problem that many school districts are trying to manage. So what should employers be doing? Well, to start, they should be reading this blog post. If they do, at least they’ll know about the existence of these “anonymous” social-media apps and about the potential issues the employer may be facing already because of them. Next, employers should consider investigating for themselves. Have an individual from HR subscribe to the service and see what, if anything, is posted about the company. Although it may hurt to find out, it’s better that you know so you can make a rational decision about how, if at all, to address it. In the next post in this series, I’ll discuss “auto-expire” apps that enable users to set an expiration date on their posts and messages. Stay tuned.